Sure sure, you might think that these are just cute little ghosties, but in Japan they are so much more than that. 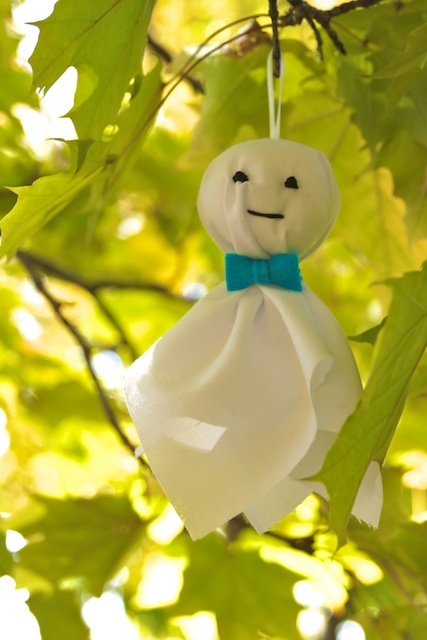 You see, teru teru bozu - which roughly translates to shiny shiny monk or sunny sunny boy or something along those lines - is a traditional Japanese doll used to ward off rain. 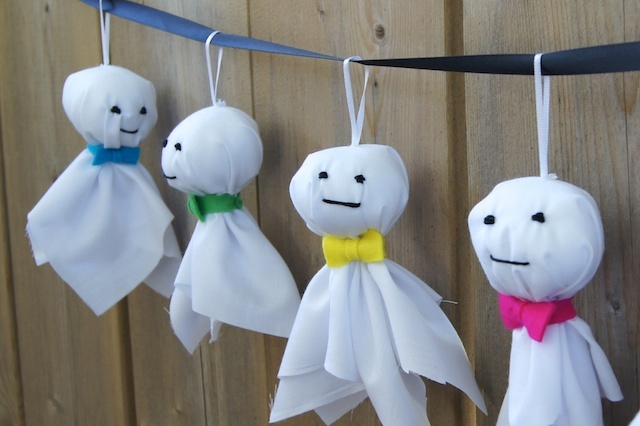 Common in the rainy season, teru teru bozu are hung in windows to stop or even prevent rain. They are often made by school children before big field trips or sports days to ensure fine weather for their upcoming event. Now, should you find yourself in need of rain, simply hang your teru teru bozu upside down and he will invite the rain to come. 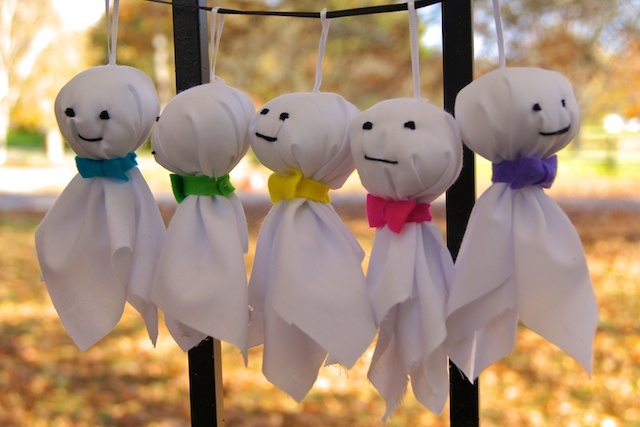 The best part about teru teru bozu, is that there really aren't any rules for how to make them. Sometimes made using tissue or paper towel in Japan, you can use any materials at hand. For ours, we wanted dolls which would last... at least a little while. 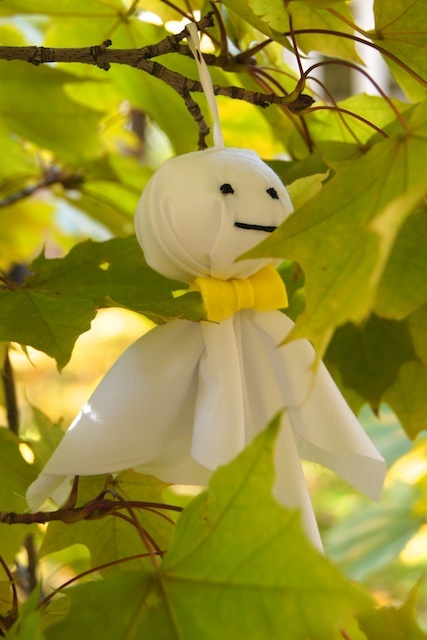 Want a teru teru bozu, Omiyage-style? 1. Cut a 8 1/2" square of white fabric. You can use pinking shears or finish the edges or even use a circle - it's up to you! 2. Grab a small handful of fibrefill (or other filling of your choice. Work with the fibrefill to form it into a ball. 3. Place fibrefill into the centre of the fabric. Gather fabric under ball of filling to form head. At this point, you can simply secure with string or ribbon - or you can take the more difficult route like us and stitch around the neck to secure. 4. If you haven't done so already, tie a ribbon around the neck or make your teru teru bozu a jaunty bow tie or scarf from felt or fabric scraps. 5. Give your teru teru bozu a face. We went with a simple embroidered face but feel free to draw it on - most people do! 6. If desired, attach a piece of ribbon or string to the top of your doll's head for easy hanging. And there you have it - your very own Japanese rain amulet - who would make a pretty great Halloween decoration too... and c'mon, who wants rain on Halloween? 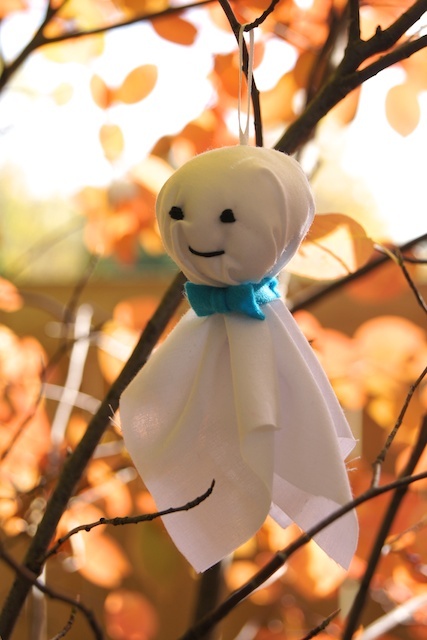 And just so you know - ever since we made these teru teru bozu, the rain hasn't dared to show its face! I am a children's librarian and I love your blog! I can't wait to do this craft with kids at my library. And my teen patrons tend to be obsessed with all things Japanese and manga so I have passed your blog along to them as well! How wonderful! I'm glad that you're enjoying our projects! I've lived in Tokyo for 21 years, and I have never seen these anywhere. I'm guessing they're something that isn't really done much anymore, but a bit of a part of the past in Japanese culture. Still, they are cute, and remind me of the ghosts I made in elementary school back in Pennsylvania. I think they might be more common in rural areas? Often made with materials on hand - tissues, rubber bands or string. I grew up in a rural area of Japan and definitely made these on a regular basis. I think there might have even been a song that went with it? Of course mine were made of kleenex and tape and had smudgy marker drawn faces. I am a nursery teacher in Japan and they are definitely everywhere in schools. You are right about the school part. They are made every year to ward off the rain. It's a big part of the Rainy Season culture we talk about. Thanks Reila! I love Japanese traditions like this one - bits culture that carry on even as Japan grows ever more modern.